Sanchez is inevitably associated with his improvised solo drum sound track of last year’s hit film Birdman. The essential part he played in the movie brought him to the attention of millions unlikely to have known him from his work with Pat Metheny, Danilo Pérez and Miguel Zenón. Here, Sanchez collaborates with musicians from the top ranks of jazz who are masters at listening, adapting and melding. 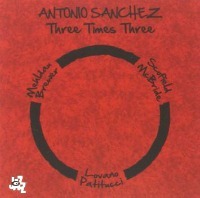 The three trios have different personalities, but under the command of Sanchez’s rhythmic mastery the 2-CD album has an adventurous consistency. Sanchez, pianist Brad Mehldau and bassist Matt Brewer find something new in Miles Davis’s “Nardis.” Guitarist John Scofield and bassist Christian McBride shine in Sanchez’s “Rooney And Vinski.” Saxophonist Joe Lovano and bassist John Patitucci have a field day with Sanchez in Thelonious Monk’s “I Mean You.” There is much to discover in this bracing collection.